The Black Bull Inn InnFamily run 17th Century Coaching Inn with Restaurant and Public Bar. 18 individual rooms, inspired by the surrounding landscape and decorated with locally crafted materials. The Restaurant provides a true ‘Field to Fork’ experience carefully sourcing local ingredients, as well as providing a ‘Classic Pub’ menu in the Casual Dining area. Our public bar provides quality drinks alongside independent and international brands. Family run 17th Century Coaching Inn with Restaurant and Public Bar. 18 individual rooms, inspired by the surrounding landscape and decorated with locally crafted materials. The Restaurant provides a true ‘Field to Fork’ experience carefully sourcing local ingredients, as well as providing a ‘Classic Pub’ menu in the Casual Dining area. Our public bar provides quality drinks alongside independent and international brands. 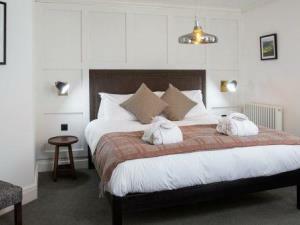 The Black Bull Inn sometimes limits bookings to 2 or more days. Calfe sometimes limits bookings to 2 or more days. Superior sometimes limits bookings to 2 or more days. The location is really close to the prettiest places in the district. The food at the restaurant was extremely good, personnel really kind and professional. Definitely the staff helped me and my girlfriend to have a pleasant memory of our staying. I will book next time without any doubt. I will strongly recommend it.